I want to win a week in To Tuscany villas! Hello from my not-so-new blog! If you’ve been following me for a while, you would have probably knew that I shifted to this domain some time back but it gave me so much problems that I shifted back to WordPress. After enlisting the help from an expert, my blog is being reborned! It looks so much better than my previous attempt… haha! Sorry I have been absent for quite a while, was pretty busy at work for the past few weeks and was waiting for the site to be ready! Now that the site’s up and my work has almost completed, I am back to blog more frequently – I have lots of recipes to blog about, not to mention some of my remaining travelogues! Currently the Recipes and Conversion pages aren’t ready yet, so you will get an error when you click on them, will try to get them up as soon as possible! 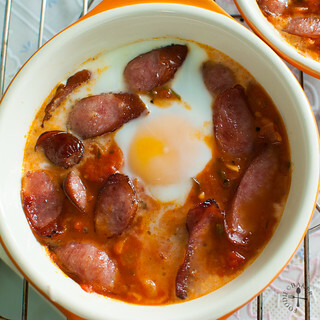 I really love the slideshow, you can click on the picture that you like and it will bring you to the relevant recipe post! I’m thinking of using it to share meal ideas whenever a celebration is coming up (like Valentine’s Day or Christmas), so you will see different photos being featured every now and then! Let’s come back to this recipe… are you wondering what’s with the out-of-place sentence right at the start? I’m actually participating in a blogger competition to try and win a week’s holiday in Tuscany, Italy! Every foodie will stand a chance in winning the competition – just prepare a Tuscan-inspired dish using olive oil, tomatoes and parmesan cheese and blog about it! 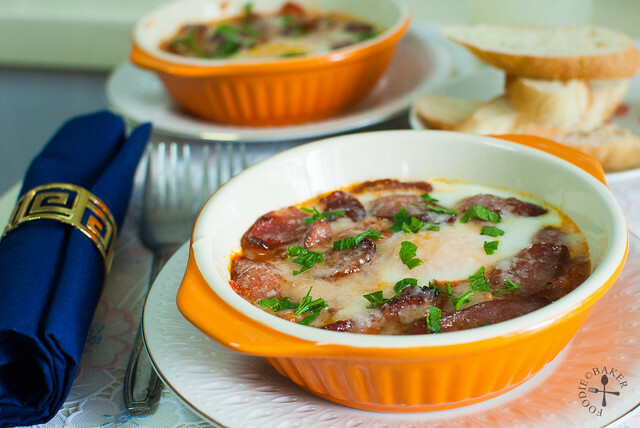 While browsing for Tuscan recipes to try out, I chanced upon these Tuscan Baked Eggs which got me hooked. I once tried a dish of poached eggs in tomatoes and I really loved the combination – the tangy tomatoes, sweet and oozy poached egg, together with the salty parmesan cheese creates such a real comfort dish. And not to mention that dipping the bread in the oozy and sweet egg yolk is such an ecstatic moment! I decided to add in some smoked sausages so that the dish will appeal more to X (can’t live without meat haha), and it was really good as the sausages added another depth of flavour and texture into the dish. It is quite different from what we usually have for breakfast here in Singapore, but it’s definitely a new and delicious menu item for us in the future! 1) Bake the sausages until slightly crisped on the edges. 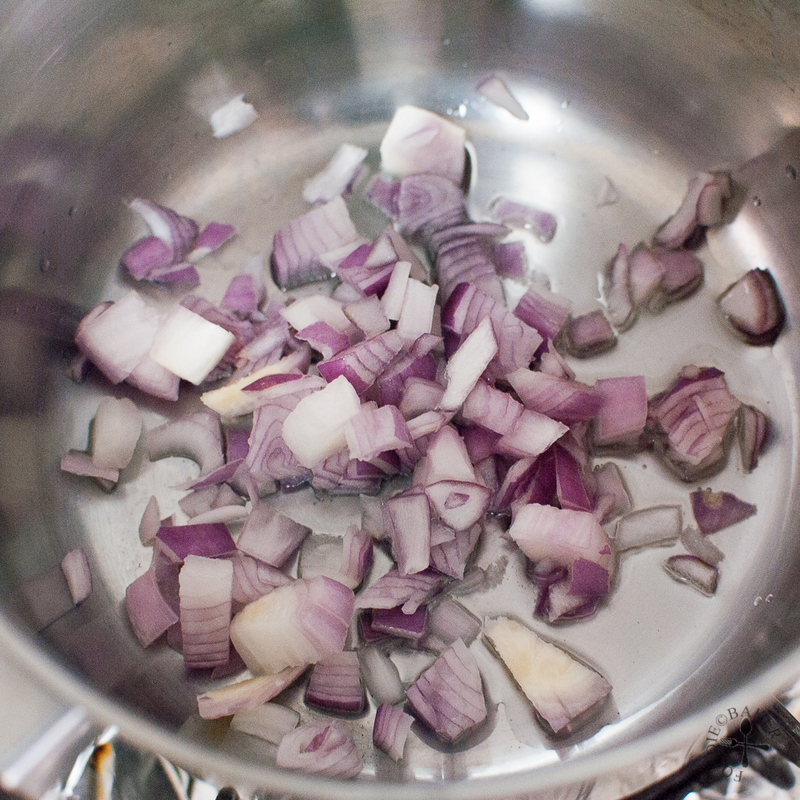 2) Saute the onion in olive oil until softened. 3) Add in some garlic and saute until fragrant. 4) Add in tomatoes and simmer until thickened. 5) Spoon some of the sauce into a baking dish. 6) Crack in one or two eggs. 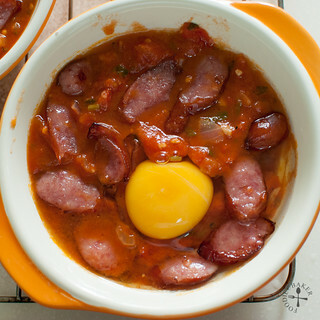 7) Spoon more sauce, be careful not to cover the yolks. 8) Sprinkle the baked sausages all over. 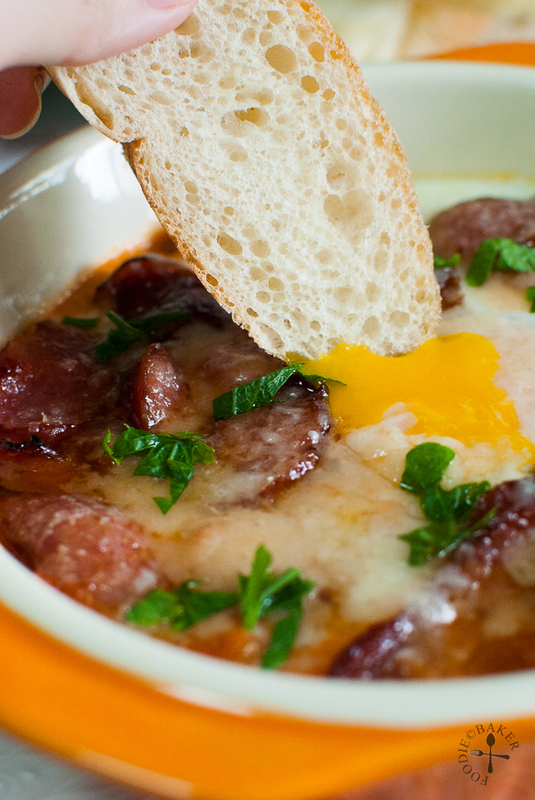 9) Bake until the yolk is still oozy and the whites are almost opaque. 10) Sprinkle parmesan cheese and broil until cheese has melted and egg is to desired doneness. Preheat the oven to 190 degrees Celsius. 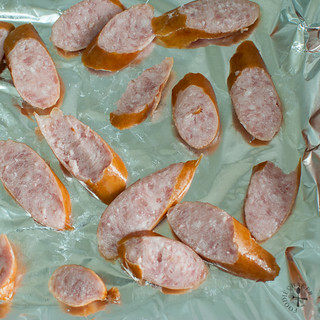 Spread the sausages on a lined baking sheet and bake for 15 to 20 minutes until the sausages are slightly charred and crispy. Remove and set aside. In a small pot, heat the olive oil until hot over medium heat and add in the onion. 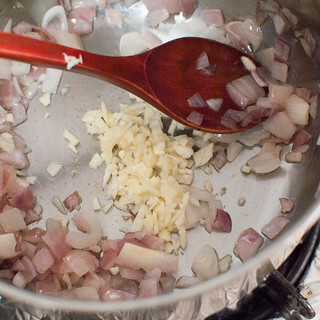 Sauté until the onion has softened and add in the garlic. Sauté until the garlic is fragrant and add in the tinned tomatoes. Bring to a boil and turn the heat down to low. 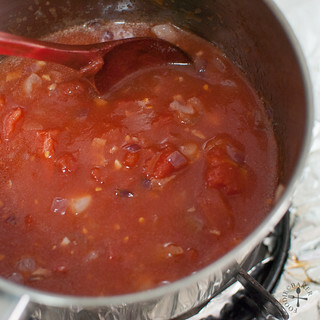 Simmer the sauce for 15 to 20 minutes until the sauce has thickened and reduced slightly. Spoon ⅔ of the sauce into 2 oven-proof serving dishes. 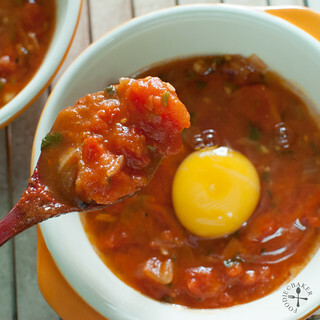 Crack in the eggs and then spoon the remaining sauce all around the eggs, taking care not to cover the egg yolk with the sauce. Divide the sausages between the dishes, pressing them down into the sauce gently. Bake the eggs for 10 minutes until the egg yolk is still oozy but the whites are almost opaque. 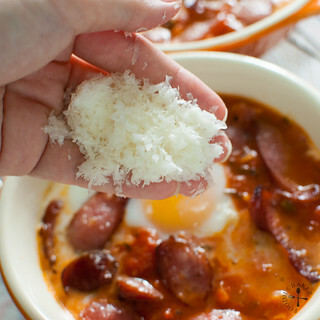 Sprinkle as much parmesan cheese you want over the eggs and continue to bake for another 2 to 3 minutes until the cheese has melted, the whites are fully opaque and the yolk to your desired doneness. Sprinkle with parsley and serve with bread. 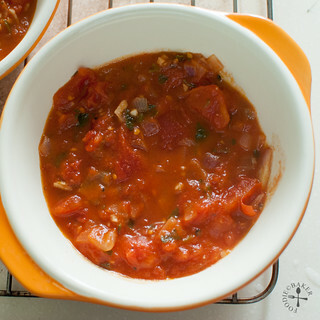 Super Naggy: I used canned tomatoes as it’s a lot easier and faster, you can use fresh tomatoes as well, about 4 to 6 large fresh tomatoes. 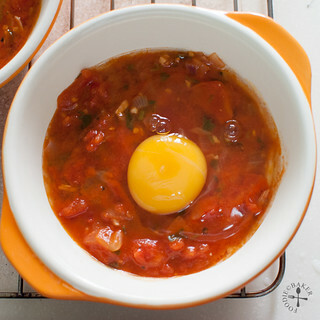 Instead of cooking the sauce and then dividing them into 2 serving dishes, you can cook the sauce in a skillet (oven-proof) and crack the eggs in directly before finishing it off in the oven. I’ve listed 2 to 4 eggs as it really depends on how much you want to eat. As X and I already had some food before this dish, I used only 1 egg per person, but feel free to use 2 eggs per person! Yep, looks so tempting! I would love to give this a try if I may:D lovely photos and good luck in your competition! 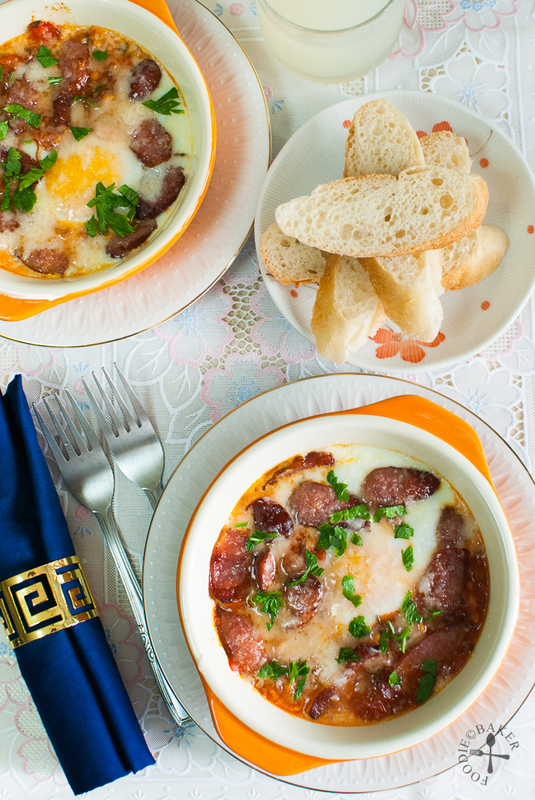 Your Tuscan baked eggs definitely deserves a vote from me 😀 So scrumptious! Hi, I’ve voted for your recipe. Hope you win! Your photos look so delicious that I just want to eat them. Happy cooking! Hi Namie, thank you so much! Haha I think quite hard as other people have so many votes! But thank you very much for your support! This is exquisite and I know, delicious! Auguri! WOW!! Beautiful new site! Worth the all the waiting all these months! 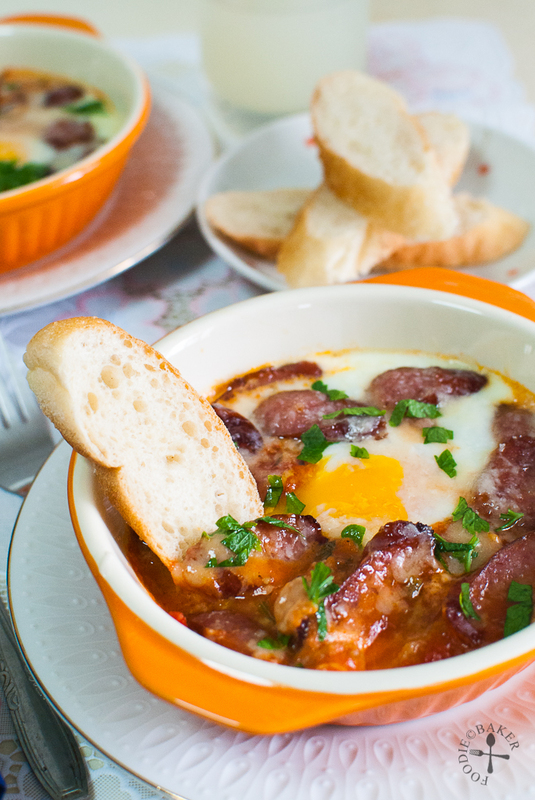 And that Tuscan Eggs looks absolutely delicious! I’m practically drooling, have not even had my dinner cos I wasn’t hungry yet, but now, my tummy is growling just looking at the photos! Yum! What gorgeous looking eggs! Love all the ingredients.